2. 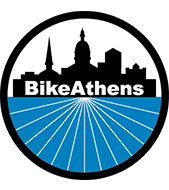 Road bicycle ride to Winterville, lead by BikeAthens Board member and unofficial "bike mayor" of Athens, Carol Myers. 25 miles, chill pace, no drop. 3. Cruise around town ride with BikeAthens' Scott Long and Georgia Bikes' Elliott Caldwell to check out the Firefly Trail, new North Oconee River Greenway segments, and more.